Okay, I'm sorry, this isn't my Ask Nenette - Part 2 vlog. No, don't worry, my kids aren't sick. It's the camera. It's actually at the opposite end of the city. Roomie and Lam went to a party last weekend and forgot the camera there, along with Lam's "Hawaii" hat. I had the most lovely experience of getting a box of cookies from an awesome girlfriend -- pictures of "the big opening" (yup, Rougie, it still sound perverted) to come. I've been drinking more coffee lately thanks to the stupid VIA sticks from Starbucks. As annoying as the commercials are, they don't lie. I really can't tell the difference between this stuff and the brewed stuff. And now, I'm hooked. DAMMIT! Oh, and because I can't drink coffee black, I've been having more dairy too. Stupid dairy. I have to wait for Roomie to do it for me. I'm once again reminded of how dependent I am on him to download my pictures, repair major appliances, maintain our network of computers (don't let the fact that I'm an enginerd fool you -- I haven't even tried to figure out how Roomie's wired this place), reach high cupboards, and so many more things above and beyond the hot monkey lovin'. So, yeah, Roomie is not allowed to leave me for Jessica Alba. My Freebie List has changed a teensy bit. Check it out on my sidebar. 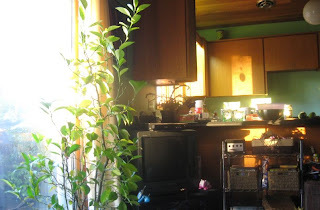 I've written yet still have to upload my latest Canada Moms Blog post. Stay tuned. Mittens' relationship with her boyfriend Buddy has turned somewhat "love/hate". He loves -- She hates. He's always skulking around in our yard looking for her. 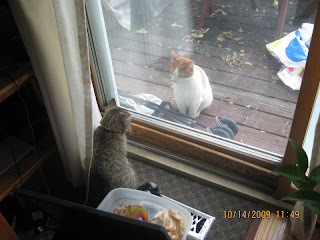 If she isn't outside hissing at him, she's inside coldly gazing at him from across the glass. Her response? Desperate mowing and clawing to get outside. To hiss at him. Weirdo. * - Which was my fault, because last summer, when I was doing some template redesign, I did some testing on IE (I prefer to use FF), and managed to download the digital equivalent of VD onto my desktop computer. Which prompted us to go from Windows XP to Ubuntu, which also rendered the program to download pictures unusable. Yes, I rawk. I like the cat on the roof. He needs to wear an orange trenchcoat and hold a big ghetto blaster over his head, playing "In Your Eyes". Just call him Lloyd. Actually, Mittens' behaviour seems pretty typical, doesn't it? Let a suitor hang out until she's bored with him, then spurn him! Are you saying you never saw any of this in your adolescence? There wasn't a special class in it at SMAG? And when I read "VIA stick", I thought it was some sort of WiFi device you could plug into a laptop on the train... oops. Is it solid enough to chew on like jerky? Love these types of random posts! 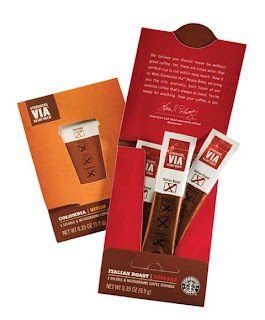 I too LOVE the VIA sticks of coffee from Starbucks... we go through a 12 pack container in just days! Awesome-ness! I also can't download? upload? the pictures off my digitial camera on my own... oopsie! 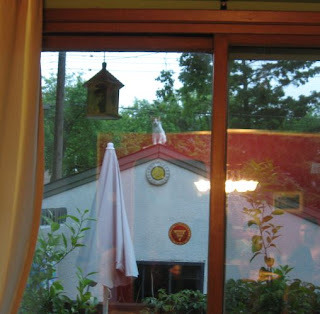 Um, that photo of Buddy on the roof is just priceless. I couldn't stop giggling! I kind of heart your cat in the biggest way. I love me a fellow Bey-otch.